A couple of Kalamazoo insurance executives are shaking up the West Michigan human resources world through their participation in a global event series called DisruptHR. 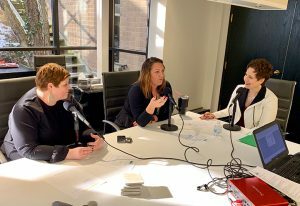 Shannon Bronsink, Director of Marketing & Communications for Keyser Insurance Group in Kalamazoo, and Cassie Goodband, Keyser Sales Executive, organized Kalamazoo and Grand Rapids DisruptHR events last summer. They talked about the program with Sheri Welsh for The Welsh Wire. What’s different is DisruptHR’s dynamic, fast-moving presentation scheme — 14 speakers get only five minutes each, with slides rotating every 15 seconds. “I think HR people, a lot of times get the reputation for being boring and really serious, good at following rules. Disrupt HR is the exact opposite of that. The whole idea is to inform, energize, empower people who work in this space and get them to think differently about their work,” says Bronsink. A Kalamazoo DisruptHR event is scheduled for May 1. Learn more. Listen to Sheri’s entire interview with Shannon Bronsink and Cassie Goodband.